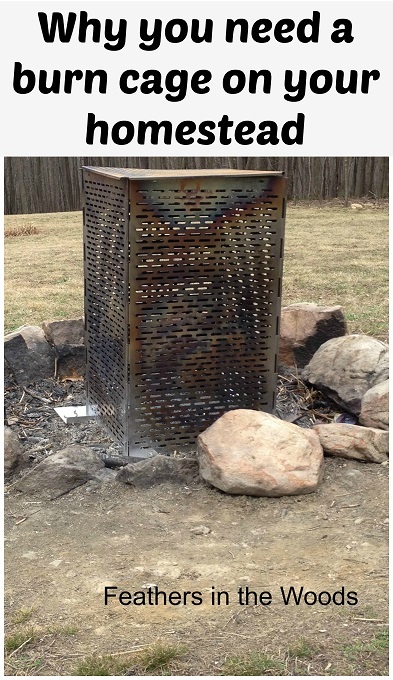 My husband bought a burn cage last week. I looked at him like he had 3 heads! Seriously, I thought it was the dumbest thing he could have done. What in the world did we need that for? I mean, we already have a firepit why get a stainless steel cage to burn garbage in? Seems like overkill to me. So, he tries to explain it to me....and the explanation includes "don't put plastic in it" What the heck? That's the best part of burning! Plastic makes all the paper burn faster, right? Well, ok...I do know you're not supposed to burn plastic. You can try to explain that to me till you are blue in the face and I will still think 3 seconds of burning a plastic water bottle is better than 1000 years in a landfill! If we had a decent recycling program out here, it would be different. Unfortunately we don't. I came up with the system that light plastics get burned, laundry bottles get saved as sharps containers and really heavy stuff goes in the garbage. We do have a paper recycling program of sorts. You know those paper retriever bins? We have those at the high school. But you can only put clean paper or cardboard in those. I end up burning a lot of used napkins, paper feed sacks, pasta boxes etc. I much prefer burning garbage then a bonfire. Weird right? Burning wood just for fun seems like a waste to me. It's a nice 'camp style' experience and all, but I need that wood for winter heat! Anyway, I walked around the burn cage for about a week without going near it. Then the day came....the inevitable....the garbage can was full of boxes and I needed to do something about it! I slowly drag the can out to the fire pit. There it sits in the sun. It looks like nothing more than 4 metal screens hooked together and a bunch of money wasted. Hmmm. There's no sending the burn cage back, he's already used it. I have no choice. Into the cage the garbage goes. I grab a napkin out of the pile and light it with my lighter. All I had to do was drop it in. Once. No relighting. No mixing. No making sure it's lit on all sides. I put the lid on and walked away. Check out what Allstate says about location and coverage for fire pits. This might not be so bad after all. No half burned papers blowing across the yard. The ashes stayed hot in there for hours! I must have dropped 'just one more thing' in there 20 times...and every time it was gone when I came back. I've realized that the nice thing about it is that I can throw small amounts in there, light it and walk away. If it goes out, then it goes out. It'll burn next time I throw something in. No more waiting till the can is full to burn. I can do it even on windy days. Half burned items eventually do burn completely and don't end up all over my yard in the meantime. Nothing is digging through my fire pit for half burned food packaging anymore. That's a huge bonus here in the woods! Check out what HGTV says about fire pit safety. The only downsides are that we will have to take it out for bonfires and let's face it....it's ugly! It does look a world better than a traditional burn barrel though, so there is that! Supposedly it does come apart for removal and storage. Obviously I've never tried, but I can see how it's possible. This burn cage apparently has great reviews which is why he chose this particular model. I can believe it has great reviews because it really is a quality product. I guess you can say I've come around to his way of thinking on this one. Don't tell him that though. There's no telling how he'd use that information! Hey, that really sounds like a great idea! I wish we could put a burn cage over our huge brush pile we have waiting for us to burn. In the spring it's too windy to burn, and in the fall we're afraid of setting the corn field on fire with that huge bonfire next to it. What to do. This was a great post. Enjoyed it! Oh wow....that sounds like a 'wait till it rains' situation. Frustrating for sure! Good luck and thanks! A good way to solve this is to make a good sized hole under the branches in the middle of pile. I save 3-4 paper sacks of paper items to burn. Wait for a decent rain that you expect to rain for a while and go and shove those paper sacks into the hole in the middle and light them. I did this and went back into house and watched it burn like a torch. Only parts that didn't burn were the branches on the very edges of the pile. Any sparks that flew up were quickly extinguished by the rain. I have lots of old documents that need to go through the shredder right now. Wish I have your burn cage as it would be so much faster! I am your newest follower. Stop by for a visit sometime. I burn a lot of mail! Especially all that 'you are pre-approved' crap. lol I'll swing by and check out your blog now! Wow that is funny. I have not even heard of that but hey I am from the state that would like to ban all charcoal bbqing and any campfires. I hardly think that is the main cause of pollution around here. More like the 50 million cars on the roads everyday, all the planes that the rich folk fly in all the time and then try and tell me to lower my carbon footprint. Okay I am ranting. Cool thingy though. Oh wow! Good thing she didn't! I stop by every week....I love your hop! Perfect solution! Much easier to use a cage than risk burning down the house or fields. Oh, you are so right! I did set the yard on fire one dry spring. The hose wasn't hooked up yet and I ended up beating out the brush fire with a plastic rake. The cage should keep that from happening again! This is grate, lol 'great'... with all the drought, there are always new burning rules put out to follow. With all things, the trash pickup costs are rising too, so this is awesome info to pass along! Thanks for sharing -it may seem a small thing, but in the course of our everyday lives this could end up to be a huge help! Personally I like this idea, when we lived in Tennessee we had what we called a burn barrel. Looked just like the garbage cans use to look when I was a kid, but if it was too windy we did not burn. While it might be ugly I think it is pretty cool, thanks for sharing on Tuesday's With a Twist, please stop by again next week, and tell us what's burning. Now off to check out your cheesecake bar recipe, I have been searching for a recipe hope yours is the winner. They use burn barrels around here too. I thought this wouldn't work in the wind but it does. The fire whips up and around violently, but it doesn't go anywhere! Try that recipe, it's so yummy! Also, it's easy to half if you don't want a full pan. Thanks for stopping by! We're featuring your post over at The HomeAcre Hop today! Congrats! Oh wow...thank you so much! Heading over there now!